Tobiano is a fantastic location for golf and special events of all kinds. From Golf Tournaments to spectacular weddings, Tobiano can accommodate your group needs. If you are not planning an event of your own, we invite you to join us at one of our regular scheduled seasonal events, or our periodic special events. Regular events at Tobiano include a weekly Men’s Night and Ladies’ Night. 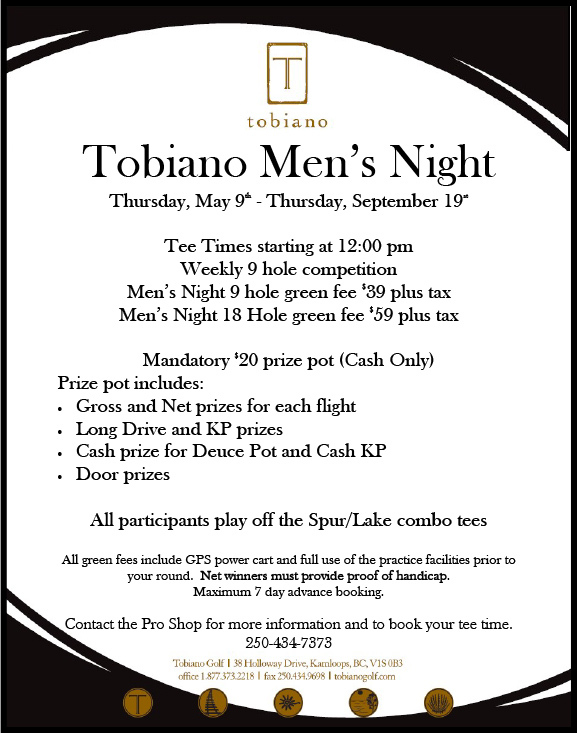 We invite you to join us for Tobiano’s weekly Men’s Night social event. Join other like-minded golfers for some good fun, a little competition, amazing rates and great dinner specials to follow! When: Men’s Night at Tobiano occurs every Thursday afternoon, weekly from May 9th – September 19th, 2019.Tee Times starting at 12:00pm. All participants play off the Spur/Lake combo tees. Interested in getting your business in front of a qualified business community and avid golfers? Consider sponsoring our Men’s night league. Men’s Night Sponsorship opportunities are available. We invite you to join us for Tobiano’s regular Ladies’ Night social events. Join other like-minded golfers for some good fun, a little competition, amazing rates and great dinner specials to follow! 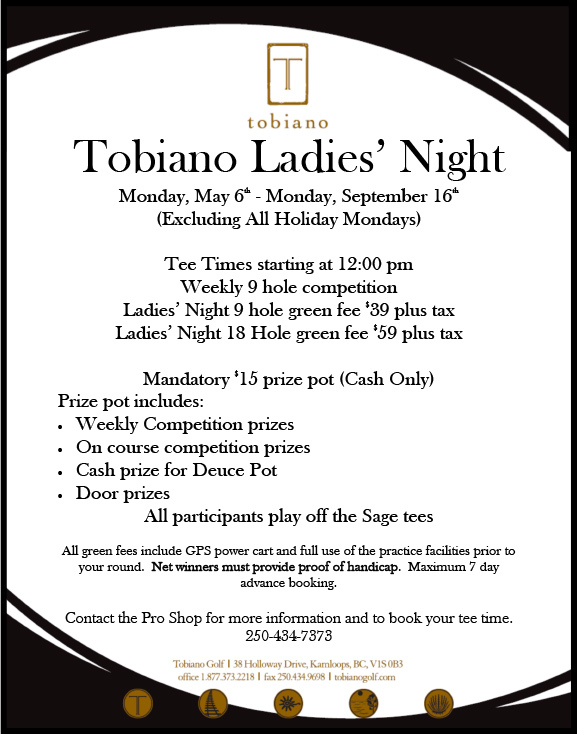 When: Ladies’ Night at Tobiano occurs Mondays from May 6th to September 16th, 2019 (excluding holiday Mondays). Tee Times starting at 12:00pm. All participants play off the Sage tees. Interested in getting your business in front of a qualified business community and avid women golfers? Consider becoming a sponsor of Tobiano Ladies’ Night.